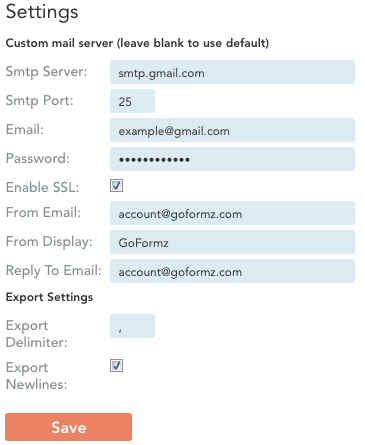 GoFormz allows you to set up your own SMTP email server for outgoing notification emails, which are typically sent using the GoFormz email server. 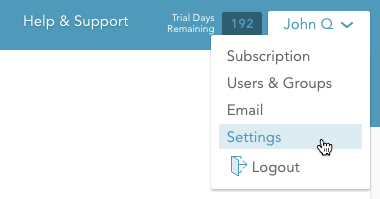 These settings are used for both the workflow events and the ad-hoc emails from the app — see here for more details. Setting up a custom SMTP email server gives you greater control over the notification emails. For instance, it allows you to use your email server to look at all the emails that GoFormz has sent on your behalf. It also lets you specify a custom reply-to email and display name in the header of your automated emails. You cannot do these things when using the default GoFormz email server. To set up your SMTP email server, click your username in the top right corner to expand the account management dropdown, then select Settings from the dropdown. Smtp Server: The SMTP server specification for your email provider. Smtp Port: The SMTP port number supported by your email provider. Some typically used port numbers include 25, 587, and 465. Email: Your full email address. Enable SSL: By default, SMTP transfer does not provide any encryption. If you want to make your connection more secure, check this box. Depending on your provider, you may be required to choose SSL. From Email: The email address that the recipient should see in the email’s “From” field. Typically this will be the same as your email address, and it should always be from the same domain. From Display: The friendly name in the email’s “From” field. This might be your company name or department name, for instance. Reply To Email: The email address to which any replies should be directed. Click Save when you finish filling in these fields. If you need additional assistance setting this up, please submit a support ticket to GoFormz, and one of our technical support representatives will help you get started.